I guarantee these delays are due to the fact that the devs are unable to find reasonable counters to Jedi Knight Revan. Its basically fact that JKR is the most ridiculously op character of all time, so much so that he has completely broken arena. And this fact is supported by the outrageous statistics, as JKR now has 90%+ of the meta. And the majority of the player base (even those with Revan) have been bored to death with the broken gameplay. I have been stating for a long time how dangerous for the game it was to create such a ridiculously op character, but no changes have been made. And now I am 99.9% sure that these Darth Revan delays are due to the fact that they are unable to create a serious counter to JKR without again breaking the game. Any other thoughts on the delay? Any other ideas on the delay? They said they retracted the initial teaser video because it had the 21st as the start date, and they were not certain that was the exact date the event will launch. Could be the 21st, could be tomorrow, could be the 28th. No official news of a delay yet. But it hasnt happened yet? Lol, you are absolutely correct. But I dont think they planned for this. Revan's kit is just the biggest most ridiculous mistake I've ever seen a competitive based game make. Really shows how oblivious the devs were to the consequences of this mistake. Well considering the pack durations (always planned to end with the event) along with the announcement, trailer and character reveals, and considering that 99% of players are expecting a release on the 21st, a delay will be a monumental embarrassment. they didn't retract the trailer, it is still up and in its almost entirely original form, short of the date being in it. The statement is CG protecting itself from false advertising. 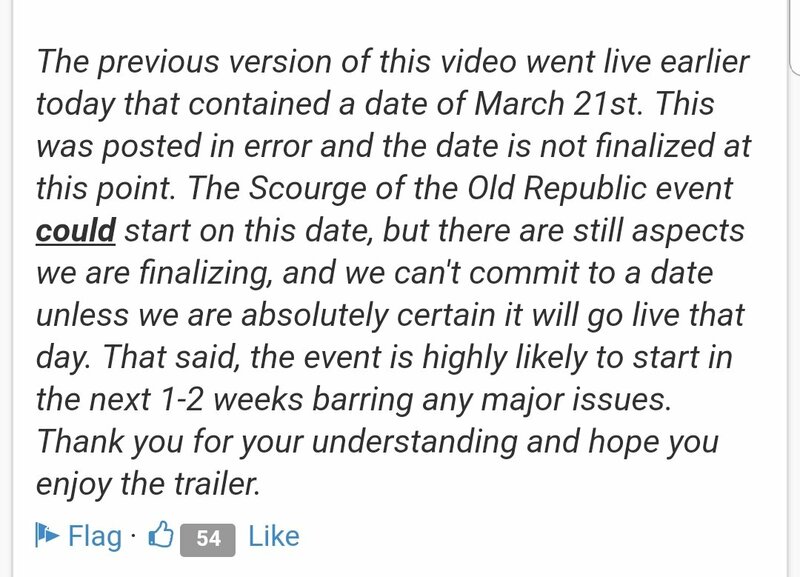 If they say the event is happening 3/21 and some unforeseen problem came then legally anyone who spent anything on Darth Revan could ask for a refund and cite false advertising. So any company with common sense isn’t going to paint themselves in a corner. Will it launch 3/21... absolutely. Unless there are substantial unforeseen circumstances which I absolutely highly doubt. Kit is up for reworks and details about deathmark changes are up. Have they ever launched an event without a week's notice before? The last two Journeys had a week. JKR announced Oct 9, launched Oct 18. RJT announced on Dec 6, launched Dec 15. Both times the announcement contained the launch date. If this event goes live in Mar 21, I believe it will be the first time they've not committed to a launch date a week, or more, in advance. Yea we'll see, my main point is that after over 6 months of preparation the fact that they are unsure about the release date is not a good sign. And a 1-2 week window, after advertising a march 21st release date is not an indicator that things are under control.